There are facts about Michael McGuire that mark the passage of his time on this earth. He was born in Portland, Oregon on April 24th, 1946; was a veteran of the Vietnam War, married, had two children, divorced and remarried. His career was in finance and banking. He was 30-year resident of Santa Barbara. 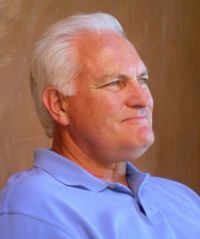 During that time, he served in Santa Barbara and Ventura on the boards of housing authorities, participated in establishing housing and rehabilitation facilities for the developmentally disabled, mentally ill, addicted, and for homeless families. His public service also included support of the arts and other social-service organizations. Beyond the fact and figures of his expertise, was the real Mike. At the core of his all too brief life were impeccable integrity and compassion for those in need. He thought deeply (and mostly privately) on a vast array of scientific, political and philosophical subject matters. From afar he might seem stoic and studious, yet when engaged in conversation, he’d reveal a thoughtful, caring man, with a brilliant mind. He enjoyed a diverse spectrum of friends that helped him expand how he saw the world. He believed in others. His goal was always to encourage employees, friends, and family to realize their talents and full potential. He’d know your name, look you in the eye when he shook your hand or gave you a bear hug. He never faltered for words, except when his heart was filled with emotion, and his soft blue eyes would reveal a profound tenderness. He was the kind of man, father, husband, and mentor that was resilient beyond belief, but not hard or calloused. He’d cuddle his cat, Buddy, with affection, give you the shirt of his back, and hold you nearly to the same elevated standards he held for himself. He saw patterns in numbers. He enjoyed designing homes and then converting those visions to reality in his spare time. He was happiest in nature: kayaking, hiking, skiing, sailing and fly fishing. The special space he leaves in the community and hearts of many will long be felt. He is survived by two sisters, Colleen Lucas and Kathy Ossenkop, the mother of his children, Marcia McGuire, daughter Kelli McGuire, son Scott McGuire, six grandchildren and his beloved wife, best friend, and pal in all that he enjoyed or held dear, Donna-Christine McGuire. A private service will be held at the Old Mission Santa Barbara. In lieu of flowers, remembering Mike through support of Life Chronicles, Arts & Lectures, AHA, KCLU, or Human Rights Watch, for which he had great appreciation, would be meaningful to his memory.